A large number of persons all over the world become distressed, if not agitated, when told the glaciers are melting. The suggestion that there are notable exceptions to this rule scarcely makes a dent in their despair. They adhere to this glacial doom and gloom like a religious cult with such fervor that one might believe their very lives are in jeopardy. Cults are notoriously impervious to science, and information that refutes their beliefs they quickly demonize. This is the emotional status of a cult’s followers, currently identified as the consensus of global warming alarmists. While this cult worships and worries at the terminal moraine of glaciers, they insist upon distancing themselves from a thorough study of the earth’s glacial history. Some irrefutable inferences must be taken from this glacial history, bringing into full view the beautiful side of the story when glaciers melt. Far from being a catastrophe, the alarmists should be worshiping melting glaciers to avoid repeating an ugly story from history. This is that story. Some alarmists’ worship of glaciers focuses almost exclusively upon them as a source of water, stored water. Glaciers usually develop from snowfall in the higher mountains. This snowfall accumulates as ice pack to whatever depth is possible on the slope, and then migrates slowly down hill to some lower level, a terminal point on land or out to sea. Going one step beyond glaciers as a water source, the alarmists next follow melting glaciers down the streams and rivers to the ocean. Once again they turn the melted glaciers into water run-off, a valuable source of water for irrigation of crops down stream. This adds a second level of fear, that when the glaciers are gone, the runoff will cease and irrigation will end. The cult prefers to ignore the broader picture, that most agricultural production is based upon rainfall, not irrigation. Irrigation is one source, but not the major source of moisture for growing the world’s food supply. 1. Man has never lived through an ice age. 2. When glaciers cover the earth, all life as we know it dies. The earth’s glacial history is well documented, by inference, from ice cores during the past two million years. This shows global temperature variation of four degrees Fahrenheit, two degrees above and two degrees below a presumed mean earth temperature. This record produced some sixty glacial periods, on average, one every 33,000 years. There were sixty warmer periods, with less ice, and sixty colder periods with more ice, or glacial periods. Throughout all of these glacial periods, mankind did not live on earth in significant numbers. Man’s survival on earth is documented only during the most recent period of warming, for the last 10,000 years, give or take a few thousand. The alarmists are so fixated upon warming, the only period we have known, that they refuse to acknowledge that global cooling, in the form of another ice age, is not survivable. They should focus their science on explaining why 59 periods of global warming and 60 periods of global cooling occurred before man showed his face on earth. Statistically this is an unlikely set of occurrences, although cults don’t like statistics. Only computers like statistics! Until science can demonstrate that the earth’s current temperature is significantly outside its historic variation, no amount of cultish propaganda will make any difference. Demonizing carbon, which all breathing creatures exhale, and its super-diluted presence as gas in the atmosphere, is the most ludicrous notion since the discovery of witches. It is a pure witch’s brew that only a cult, an ignorant consensus, misguided politicians, and those who profit from a ponzi scheme can endorse. For a cult to saddle the taxpayer with this nonsense is the world’s greatest extortion plot. The alarmists miss the most important qualities of a glacier, beyond water and irrigation. Glaciers have not always been in the mountains. They may become massive, and cover the earth as we know it. Glaciers cover the life-giving soils below, and prevent growth of any kind. It is a cold, wet blanket which man can not survive. The alarmists, in their cult, may not care much about this, either. Many thousand years back in glacial history, well over half of the North American continent was covered by a glacier. This glacier was not a simple snow cover which conveniently thawed in the spring, but was of the type that covered the continent from east to west in a frozen locker. Nothing grows on top of a glacier, inside a glacier, or under a glacier. Life giving sunshine does not penetrate a glacier, an exciting place for visiting tourists and little else. While the alarmists worship at the foot of a glacier and fear it’s melting, unless the glacier melts the earth is not survivable. Glaciers which don’t melt are a death sentence for mankind. This science-based reasoning turns glaciers from frozen water into a death sentence, at least until the next warming period arrives. When glaciers cover the earth, mankind and all of his incredible accomplishments disappear. The glacier that covered America’s heartland is estimated at 600 feet in depth along the Kansas-Nebraska border. One may validate this estimate through one of the world’s better known geophysicists, Don Steeples, at the University of Kansas. With Don’s great wit and wisdom, he might also suggest that the busload of nuns that disappeared while touring the vast North American glacier was badly exaggerated. 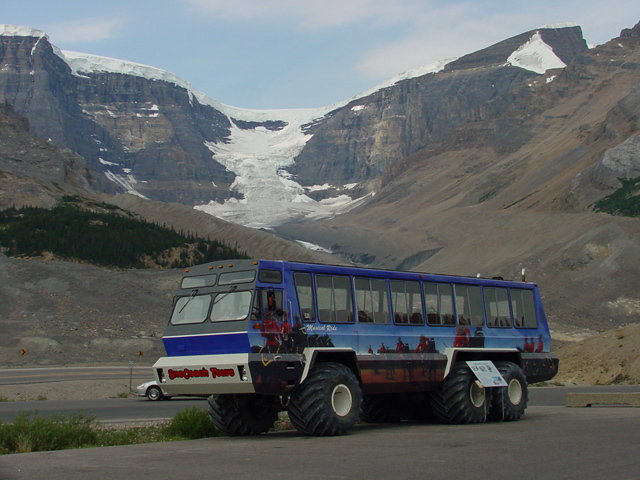 Tour Bus with Athabasca Glacier in the Background: The cult will notice how much smaller the glacier became just while reading this piece? With the great depth of the North American Glacier, it covered all the productive land many hundreds of miles south of the Kansas-Nebraska border. What remaining land was arable was an integral part of a short growing season incapable of producing much in the way of sustainable produce. As the breadbasket of North America, any human inhabitants would be huddled along the southern coast or much further south in the equatorial regions, picking fruit and berries and swinging through the trees. There is no reason to believe that only North America was inundated by this glacial period, which was world wide both south from the Arctic and north from the Antarctic. This glacial period made the earth essentially uninhabitable by humans. If such a period were to return, virtually all of civilization would disappear, assuming that man survived that long. It has only been with the melting of this mammoth earth glacier that man finally arrives, survives, and prospers. 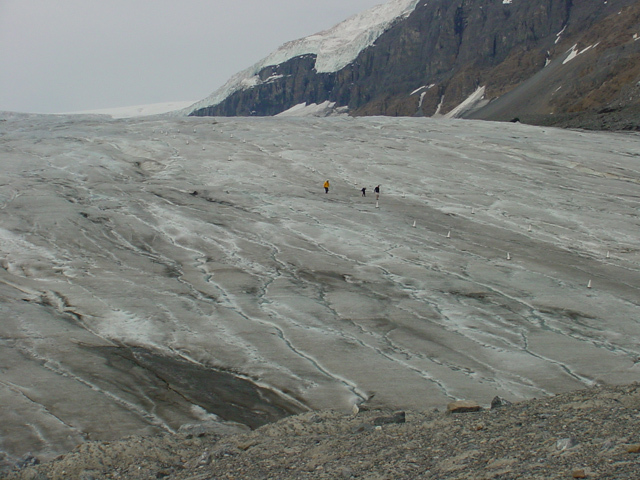 With the melting of this glacier the land became accessible, arable, fertile, and productive. Man has learned to cultivate his own produce in abundance, and has built a civilization and unworldly structures that boggle the imagination. His science, engineering, and ingenuity are the wellsprings of his phenomenal success. 4. a pinch of common sense. One final point is that the earth does not have a single, constant, average temperature. Such a notion is a statistical necessity required for computers to make a prediction into the future. Reasonable folks, with a life, are forced to live each day as it comes as best they can. Any projection 50 years into the future, in itself, is fools’ play. Cults and Congress excel at this foolishness, and they all should gather on a glacier to be swept up into the icy tail of a passing comet. Cults provide great entertainment. “We need to burn more fossil fuel to heat-up this planet. Global warming is a beautiful thing”!!!! Today’s solution, in the cult’s book, becomes tomorrow’s problem. Such is life in the cult of global warming!